Oliver Sacks, Renowned Neurologist And Author, Dies At 82 : The Two-Way His book Awakenings, about reviving patients from a catatonic state, was turned into a 1990 film. He also wrote more than a dozen other books, including The Man Who Mistook His Wife for a Hat. Neurologist Dr. Oliver Sacks speaks at Columbia University in June 2009 in New York City. Sacks, a prolific author and commentator, has died at age 82. Oliver Sacks, the famed neurologist and best-selling author of books such as The Man Who Mistook His Wife for a Hat, died of cancer today in New York City at the age of 82, a longtime friend and colleague has confirmed. The London-born academic's 1973 memoir Awakenings, about his efforts to use the drug L-Dopa to bring patients who survived the 1917-1928 encephalitis epidemic out of their persistent catatonic state, was turned into a 1990 Hollywood film starring Robin Williams and Robert De Niro. He was the author of a dozen other books. A friend and colleague, Orrin Devinsky, who is a professor of neurology at New York University, where Sacks worked for many years, emailed NPR to confirm the death. "Dr. Sacks variously described his books and essays as case histories, pathographies, clinical tales or 'neurological novels.' His subjects included Madeleine J., a blind woman who perceived her hands only as useless 'lumps of dough'; Jimmie G., a submarine radio operator whose amnesia stranded him for more than three decades in 1945; and Dr. P. — the man who mistook his wife for a hat — whose brain lost the ability to decipher what his eyes were seeing." Author Lisa Appignanesi, writing in The Guardian earlier this year, said of Sacks that he could transform his subjects into grand characters. "For all their lacks and losses, or what the medics call 'deficits', Sacks's subjects have a capacious 19th-century humanity, " Appignanesi wrote. "No mere objects of hasty clinical notes, or articles in professional journals, his "patients" are transformed by his interest, sympathetic gaze and ability to convey optimism in tragedy into grand characters who can transcend their conditions. They emerge as the very types of our neuroscientific age." "I was fascinated that one could have such perceptual changes, and also that they went with a certain feeling of significance, an almost numinous feeling. I'm strongly atheist by disposition, but nonetheless when this happened, I couldn't help thinking, 'That must be what the hand of God is like.' "
Sacks did a TED Talk on the subject in 2009. In an Op-Ed that appeared in the Times in February, Sacks announced that what had started out as a melanoma in his eye had spread to his liver and that he didn't have long to live. "It is up to me now to choose how to live out the months that remain to me. I have to live in the richest, deepest, most productive way I can," he wrote. 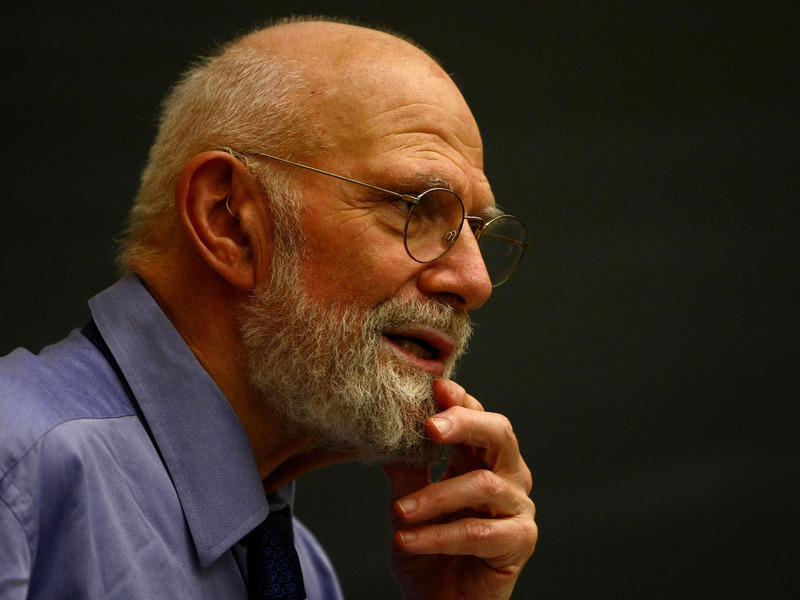 "I have been lucky enough to live past 80, and the 15 years allotted to me beyond Hume's three score and five have been equally rich in work and love," Sacks wrote. "In that time, I have published five books and completed an autobiography (rather longer than Hume's few pages) to be published this spring; I have several other books nearly finished." "[N]ow, weak, short of breath, my once-firm muscles melted away by cancer, I find my thoughts, increasingly, not on the supernatural or spiritual, but on what is meant by living a good and worthwhile life — achieving a sense of peace within oneself. I find my thoughts drifting to the Sabbath, the day of rest, the seventh day of the week, and perhaps the seventh day of one's life as well, when one can feel that one's work is done, and one may, in good conscience, rest."